Nothing like nice and simple craft projects to ease my way back into making custom orders as well as creating handmade gifts for my friends and family this holiday season. During my time away I purchased a new serger and also convinced my husband to purchase my christmas present early ....hehehe....a new embroidery machine----HOW IN THE WORLD DID I LIVE W/OUT ONE BEFORE! Just the amazing things that I can now do and the personalization that all of my gifts will now have this year, I'm just giddy w/ excitement, can't you tell??!! 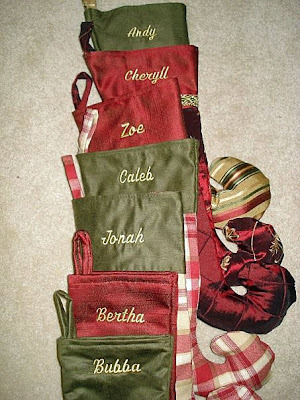 Here is the first of my custom stocking orders using applique, and all of my stockings were made using my serger for extra durability to last the family through many years. Decorator fabric for the cuff and nice soft blue velvet material for the body, sooo soft in person. Second custom order.....Embroidered stockings, my new favorite thing to make. Did you notice those cute little paw stockings? We couldn't leave out her little puppies! They had their own custom stockings too---find the pattern for them HERE. They turned out so cute, it ALMOST made me want to get a dog just so I could have one of these to hang too. Quick, simple and required less than a yard for each stocking. These would be great to place to give presents in. 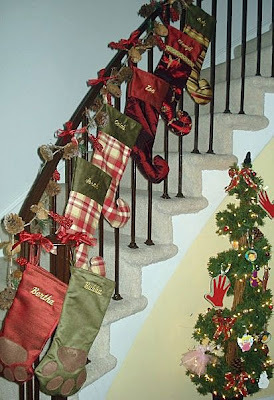 You can find patterns for stockings to create your own everywhere! Go make your own and share them with me! Love your Christmas stockings! As a long time crafter [sewing, knitting, quilting], I always enjoy seeing beautifully finished hand made items. At one time, I even belonged to the Cabin Branch Quilters and the local sewing guild. Seems like eons ago. I can appreciate the time and effort that went into sewing and completing each project. 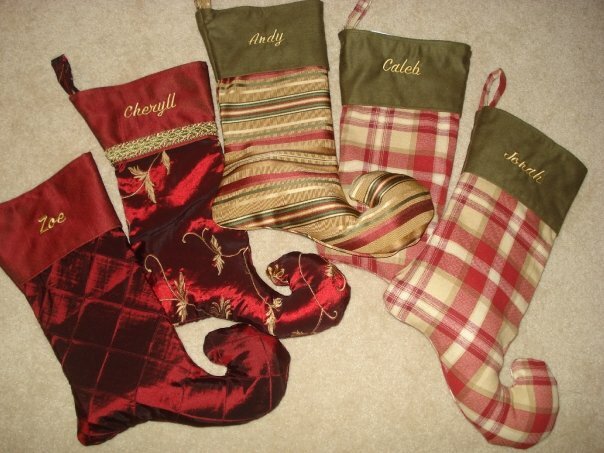 I made stockings very similar to these for my parents...years ago. Then beaded the finished stocking! Mind if I add mention your blog on our website "Living In Woodbridge VA"? Even tho the site is quite new, we're receiving many questions related to crafting and quilting in particular. If you prefer, you can literally build a page on our site, along with photos, to get even more exposure for your blog. We will be building a section dedicated to crafts, hobbies etc.